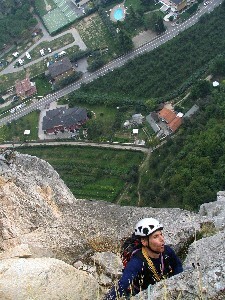 In the last days of september 2004 my guest Ivan and me, we visited Arco, top place of adrenalin sports that offer visitors activities such as surfing Garda lake, mountain biking or climbing steep walls in the valley Valle del Sarca. 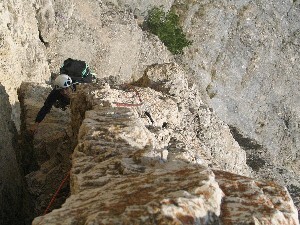 For the first day we chose not too difficult, well equipped route "Genoma" in 250 meters high wall Pian dela Paia. 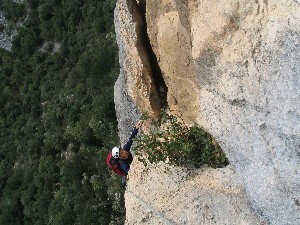 The route gave us nice climbing in solid rock of moderate difficulty up to 6a grade. In short pure pleasure in constant vertical. 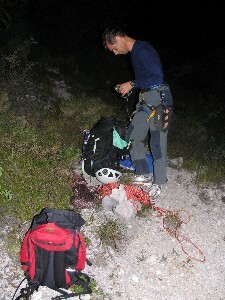 In the evening we prepared equipment for the next day and fullfilled energy supply. We had a challenge in front of us, that even very good alpinists would not be ashamed to have in their collection. We got up half past three made a short ride and walk little less than an hour to the foot of the giant Monte Brenta wall. The wall has 1000 meters high mighty overhangs that gently impose to one another. Almost at the top the peak turns over approximately 60 m above its direct line - BASE jumpers gladly take advantage of it. We had the honor to witness this wild jumps in the heart of the wall. 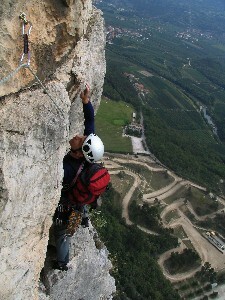 Our route "Via degli amici" (Route of the friends) takes place through overhangs and is sometimes exposed to rockfall which raises some unpleasent feelings. 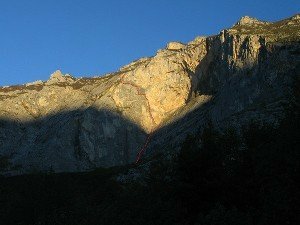 Approximately after one third of the wall the route turns left to a giant zajedo - kamin, that is by my opinion the crucial point of the route (bad protection, friability, difficulty up to "6a" grade). 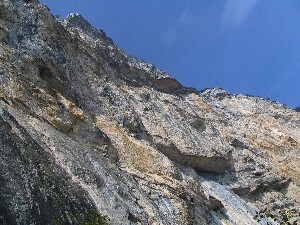 The last third part of the wall first gives a little harder free climbing with good protection solid rock (6b). 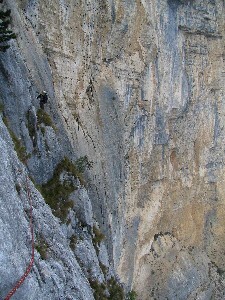 This is followed by a long crossing to the left (three full pitches) and after that mostly technical pitches (A1). We finished the route in solid 10 hours and totally satisfied our adrenaline addiction. Next we had a day off and walked around Arco, the nice town, had good icecream, spent time just looking round and spent money in many good alpinistic little stores. Another nice day. Last day we chose route "Tyszkiewicz", in the wall Colodri, that overhangs the town itself. 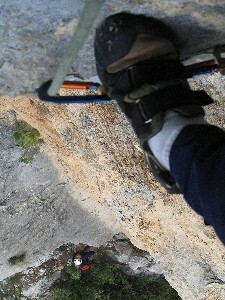 It is a little shorter route, but hard (220 m, 6b+/6a). We went home in the afternoon. 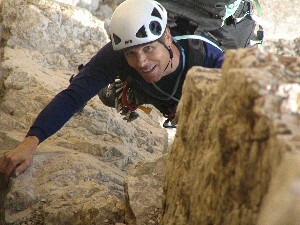 We had a couple of beautiful days that I will remember with joy as a guide and alpinist. 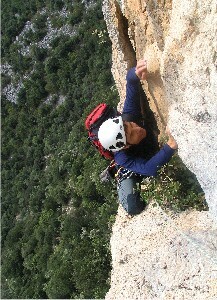 Guest Ivan showed himself as reliable and very competent co-climber. I can only wish that he ties himself to my rope again sometime!